Amazon has a great deal of fruit leather or the healthy fruit roll up. These yummy snacks are only .37 each with subscribe and save. Similar ones are at least $1 each at the grocery store. I like to eat them instead of getting a snack out of the cabinet. Grape is my favorite, but they have others. I have seen other pinterest make your own recipes. 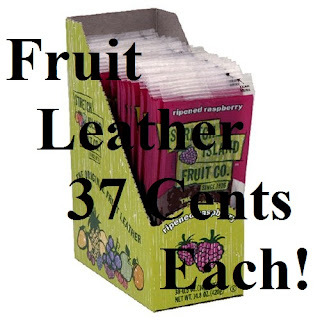 But for example by the time you buy the fruit, this is almost less expensive! Some of my friends liked this deal too. I also like that there is no other stuff added like other fruit snacks. If you have not tried Amazon Subscribe and Save, you can subscribe, and after the item is shipped cancel the subscription. I like to choose 6 months to give me a little more time to remember to cancel. With free shipping, this is a great deal! I have not seen any coupons for stretch Island Fruit Leather ever.